“For the President of the United States to stand next to Vladimir Putin — who personally ordered one of the largest state-sponsored cyber-attacks in our history — and side with Putin over America’s military and intelligence leaders is a breach of his duty to defend our country against its adversaries. 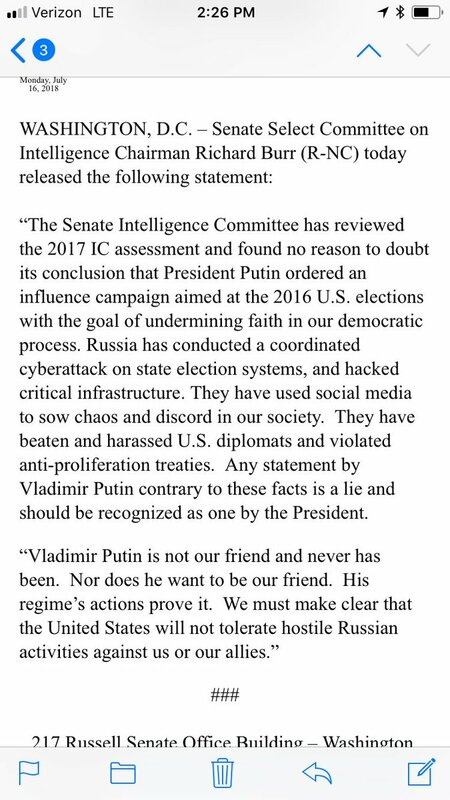 DNC on Trump Siding with Putin Over the U.S.
“Donald Trump made clear that his loyalties lie with a foreign adversary who attacked our country rather than with U.S. intelligence agencies and the American people. “Today’s press conference was a shameful display of cowardice and capitulation. Just days after 12 high-ranking Russian intelligence officers were indicted for their attack on American democracy, Donald Trump stood next to Vladimir Putin and refused to call on Russia not to attack us again. He took Putin’s side over his own government’s. And instead of denouncing Russia’s attack on our democracy, he went after American institutions. Never before has a U.S. president failed so spectacularly to stand up to a hostile foreign power. “As if things couldn’t get any more appalling, Trump said he wanted to work with Putin to investigate the intelligence agents who were indicted for conspiring against the United States. American officials told Trump who set fire to our democracy, and instead of believing them, he invited the arsonist to investigate. "The Trump-Putin summit will enrage the #NeverTrump minority in our nation as it reconfirms the President's firm commitment to America's interests in confronting world leaders. Trump was very presidential at the summit. Perhaps out of the many topics of discussion, the most significant may have been the reaffirmation by President Putin of Israel's security. This matters because Iran has designs on placing troops on the Syrian-Israeli border, an action that the U.S. and Russia can prevent. Iran's attempt to establish Middle East hegemony is counter to the interests of both the U.S. and Russia and the continued dialogue between the nation's two leaders is necessary to prevent the fuse being lit on the Middle East powder keg." PRESIDENT NIINISTÖ: -- you are most welcome. We have done our utmost so that your visit and your negotiations here would be successful. And, like we see, even the sun is with us, although it begins to be far too warm, even here in the North. But, once again, warm welcome. And we wish all the success in your meetings and negotiations with President Putin. PRESIDENT TRUMP: Thank you very much. And we very much appreciate Finland. We very highly respect your country, our relationship has been a very good one, and our personal relationship has been very good. And I enjoyed being with you a couple of days ago. NATO has, I think, never been stronger. And it was really -- it was a little bit tough at the beginning, and it turned out to be love. It really was a great meeting that we had and brought everybody together, and, I think, very worthwhile. But I appreciated your support and your help. And I will say, again, you've treated us beautifully. Thank you very much. Thank you. Q Mr. President, what's your message to President Putin today? PRESIDENT TRUMP: I'm going to be seeing him in a little while. Q But what are you going to say to him? PRESIDENT TRUMP: We'll do just fine. Thank you. Q Mr. President, I'm from Finnish press. What was the (inaudible) choice to (inaudible) Finland as a meeting? PRESIDENT TRUMP: Well, we think Finland is a great country. We had a fantastic meeting a few days ago; some of you were there. It was a very successful meeting. I think NATO has never been more together. People are now agreeing to pay, and we were having a lot of problem with a lot of people not paying, as the President will tell you. And they're paying, and they're paying more rapidly. And I think NATO has probably never been stronger than it is today. So we had a fantastic meeting, and now we're capping it with being in Finland. And the hospitality has been fantastic. Thank you. “These indictments are further proof of what everyone but the president seems to understand: President Putin is an adversary who interfered in our elections to help President Trump win.